Our cava is from Can Paixano a place with a lot of history for both Anna and myself. Anna used to visit their bar when a child with her parents, I practically lived in the place when I lived in Barcelona back in the 90s. Their cava and their rosado is delicious and is now chilling in our fridges!! 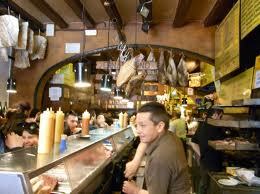 The fuzzy pic above was taken last October when we visited Can Paixano (as we always do) when in Barcelona! Glass of cava and a bocadillo for breakfast at 11am! Nothing better!